Wey hey and up she rises, wey hey and up she rises, wey hey and up she rises early in the morning. Coming about 8 months after the game was release, we publish our podcast on Assassin’s Creed IV: Black Flag. I haven’t talked about a game this large in scope on the podcast in a long time. Trying to encompass everything about the game in a mere hour and half is a foolhardy attempt. As such we only touch on the greatest hits. 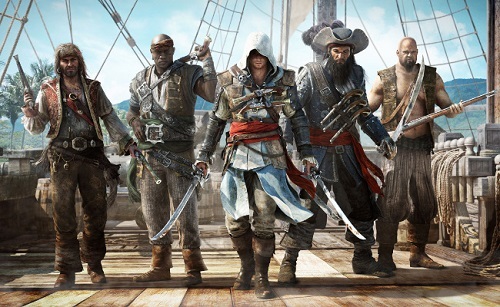 The changes in mechanics, it’s place in the franchise, Edward Kenway, the Golden Age of Piracy and a bit of the philosophy of the assassins. If I sound a little out of it at times that’s because I had been up for about 30 hours at time of recording. Because I am terrible at time management I ran through the whole thing in a 48 hour period, starting late on Friday afternoon and finishing only a handful of hours before we had scheduled to record. I think it is a testament to the game that I was able to get through the whole thing in such a manner. I can think of another Ubisoft game that I’m struggling even to find the will to turn on as contrast. Much like the game, our discussion isn’t as deep as some of the other recent ones, but there’s still quite a bit to chew on and a whole lot of fun.